On the face of it, Oxenford was an ideally-suited small jigsaw puzzle piece, slotting in nicely between Ascot (cats) and Capalaba (dogs). Rather than on the Gold Coast itself, Oxenford is in the hinterland, very close to the big theme parks that are the draw card for the area. The locality sits right on top of the Gold Coast Motorway (which I variously refer to as the Gold Coast Speedway or Car Park), so it’s also very much the dormitory suburb for Brisbane. The couple were very open about the fact that the place would be a bit bare bones because they were in the process of selling up and moving interstate. I was relieved to hear that the Foxtel Sports would be very much still in situ while I was there. The only fly in the ointment of the eight day housesit came three days before I was due to arrive. At about 6.30pm on Wednesday 10 August 2016 as I sat in Ascot, I got the terrible phone call that my mother Mary had just died in Westmead Hospital in Sydney, just three weeks shy of her 80th birthday. Mum had not been completely healthy all of her life, and epilepsy had added a very challenging dimension to her life from the age of 46 onwards with regularly irregularly visits to hospital, including a lot of ICU, and a few administrations of the Last Rites. I mention this only by way of thanks to my hosts who were very understanding of my need to absent myself for a day during the week for the funeral. They also made their second car available for me to drive down to Gold Coast Airport. That was a rather long, big travel day. Up at 4am, collapse back onto the couch at 10pm, after a drive, fly, train, walk, bus, lift, lift, walk, train, train, fly, drive day. But all that aside, it was a very relaxing week with my two little tour guides for the area. The house is on an estate where the infamous Russ Hinze used to have his horses. In the valley of the Coomera River, there are some lovely walks along its banks, and the streets are quiet and safe. We never had a routine; we just went roughly in the same direction every time, doing a loop down to the lake and back by the main access road to the riverside parks. It was a quiet and contemplative week, and a shame I won’t get to go back as the household is transplanting itself hundreds of miles away. Bill house sat (more importantly – dog sat!) for us for a week in August 2016. Bill made the effort to meet us and our dogs prior to the sitting. Our girls were happy and relaxed upon our return. We invited Bill to stay the first night of our return, before he moved onto the next house sit the following day. This was a great opportunity to know him better. He spoke fondly of the pets he had cared for as he described many pet personalities he had met. 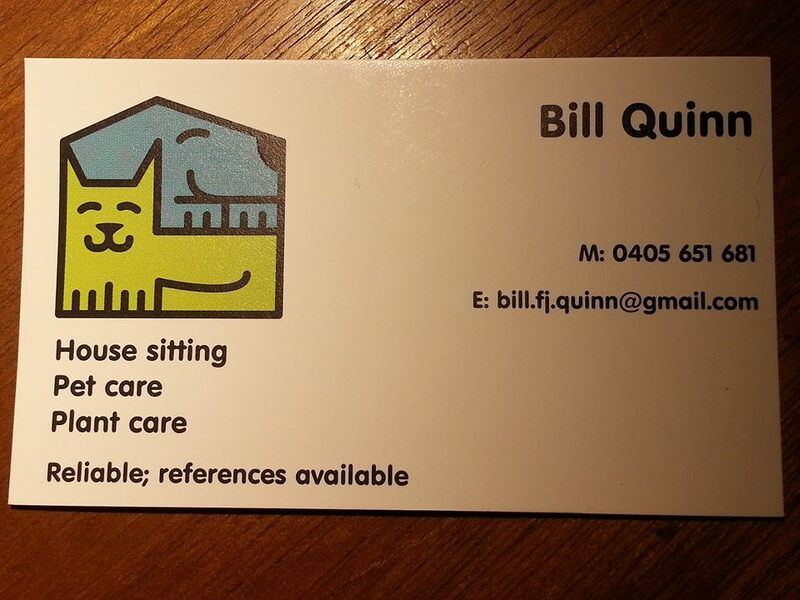 We would recommend his services to anyone needing a house sitter.